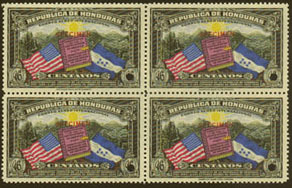 4123 SPE HONDURAS (1937) Flags*. Sun*. Mountains*. Scott No C84. Yvert No PA79. Anniversary of the American Constitution. Block of 4 with Specimen overprint in red and control perforation from the archives of printer: the American Bank Note Company. **. 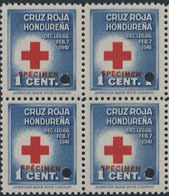 16942 SPE HONDURAS (1941) Red Cross*. Specimen block of 4. Only 300 specimens exist. Scott No RA1, Yvert No TB1. 1263 SPE HONDURAS (1956) Flag*. Scott No C269, C271, C274. Yvert No PA246, PA248, PA251. Imperforate Proofs of frame only from the archives of the printer Waterlow & Sons with control perforation. **. 9974 SPE HONDURAS (1956) Coat of arms*. Scott No C276, C278. Yvert No PA253, PA255. Imperforate Proofs of frame only from the archives of the printer Waterlow & Sons with control perforation. **. Scarce!